I rode up Ouray County Road 4 this afternoon and found many wildflowers, especially near the top—wildflowers everywhere! Not all of my pictures were in focus—rats! But here are four for you to look at. My wife calls these Sego Lilys. The closest the flower book comes is Mariposa Lily. These are single blossoms atop a thin stem with very little else to the plant. The petals are actually nearly white, darkened here to show the texture and the slight bluish cast. 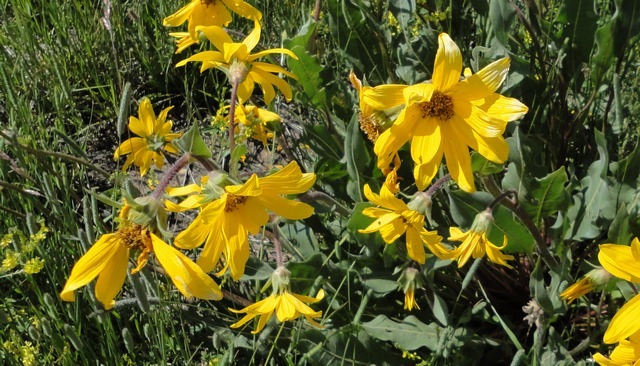 Mules Ears along Ouray County Road 4, a common sight. This entry was posted in Ouray County, Wildflowers and tagged blue aster, mariposa lily, mules ears, sego lily. Bookmark the permalink.